Interested in getting involved but not sure where to start? Curious as to how your skills and strengths can be used to make a positive impact on Green County communities? 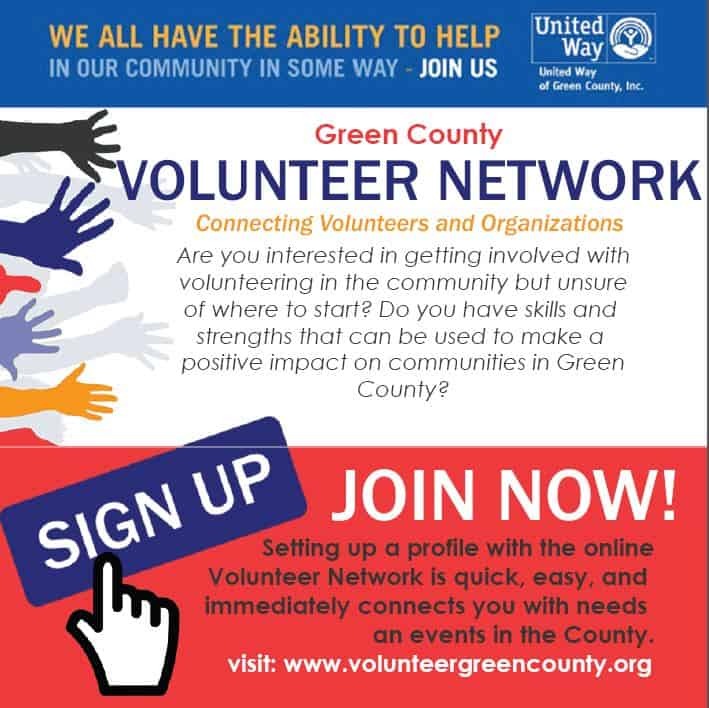 The new Green County Volunteer Network, launching on Tuesday, November 29, will be an easy way to get connected with a wide variety of opportunities throughout Green County. The Network will also enable organizations to reach out, build their volunteer base, and engage more people. “We have so many people with so many skills and talents. This new network will enable people to find ways they can help make our communities stronger – while meeting new people and having fun,” said Arianna Meier with the City of Monroe. This intuitive, easy to use web-based platform enables community members to search for opportunities based on interest, skills, and abilities. The Network showcases volunteer opportunities and charity events. Part of the goal of the Volunteer Network is to make it easy for new residents to get connected and quickly build relationships with Green County communities. “We know that when people have strong community connections they have a higher quality of life and are more invested in our communities. This increases encourages people to stay in Green County. And as we improve our communities we make Green County even more attractive for recruiting a competitive workforce and growing businesses,” said Cara Carper with the Monroe Chamber. Another goal is to use this as an opportunity to build leadership skills and community capacity. “One of the important benefits of this Network is that as we engage more people, this is an opportunity to grow the next generation of Green County’s leaders. This makes our communities stronger for the future,” said Victoria Solomon with Green County UW-Extension.